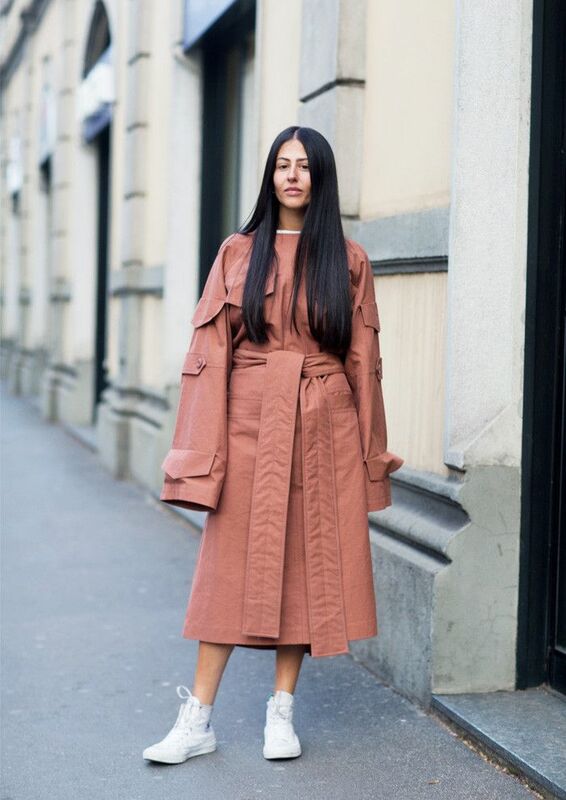 Men's Fashion Week in Milan is always a seriously dapper affair, but this season the editors in suits were joined by a number of our favourite female street style stars, including Gilda Ambrosio, Caroline Issa and Tamu McPherson, meaning the street style scene caught our eye more than ever. As well as providing us with some much-needed winter outfit inspiration, they also gave us some clues about what we can expect to see people wearing during the fashion month of February. We spotted a number of spring's key trends on the front rows, including Gucci logo T-shirts, '80s trousers with stirrups and bold printed coats by of-the-moment label Jacquemus. If you are on the look out for some winter styling inspo, scroll through the gallery below to see 13 of the best looks from Milan. Style Notes: Follow Gilda Ambrosio's lead, and style your trench coat like a dress, belting it and pairing it with bare legs and white high-tops. Style Notes: Tamu McPherson tapped into the '80s trend wearing Balenciaga trousers with stirrups over her check heels. Style Notes: Linda Tol opted for classic '90s sportswear, wearing white Diadora trainers, Joseph dungarees and a Stella McCartney puffer jacket. Style Notes: One of the biggest trends for this summer is head-to-toe florals, and Caroline Issa shows how it's done in a floral coat and a mismatched pleated floral skirt. Style Notes: For an extra layer of warmth, Linda Tol placed a simple black hoodie underneath her statement striped robe coat. Style Notes: Caroline Issa tapped into the pyjama trend, wearing a bold yellow silk trouser set. Style Notes: When it's cold, it pays to lean on fun accessories such as Jan-Michael Quammie's bright turquoise clutch and oversize sunglasses. Style Notes: Candela Novembre looked effortless in an Attico suede coat and backless black leather mules from Zara. Style Notes: This show-goer shows how to wear summery floral dresses in winter, by layering her Vetements dress over jeans and pairing it with chunky boots. Style Notes: This blue-and-white check Jacquemus coat has been one of the most-spotted items this fashion month, and Lara Djandji paired hers with bright green wide-leg trousers. Style Notes: Sherry Shen tapped into the mix-and-match trend, tucking a printed shirt into a high-waisted jazzy skirt, and she used a belt and an oversize green coat to blend the look together. Style Notes: Gilda Ambrosio opted for a more laid-back front row look, wearing slouchy grey jogging bottoms with Converse and an oversize fur coat. We heart the cute animal pouch! Style Notes: Designer T-shirts are the cult buy of the moment and Erika Boldrin wore a black logo tee by Gucci with a statement oversize embellished coat. For more street style inspiration, see what the girls in London are REALLY wearing right now.